This fused glass frit pendant is made from white System 96 and multi-colored frit blend normally used by bead makers. The blend is produced by Glass Diversions who have a range of mixes in different COE's. Earrings can also be made this way, there is no set size for making these fused glass items. This project was madecin an Evenheat Studio Pro tabletop fusing kiln with an infinity switch. I have not tried them in my other computer controlled kiln, depending on the top temperature there is no reason why they can't be made in a computer controlled kiln. To fuse this project you will need to take the fusing temperature above 1600 degrees F to achieve the end result. At this temperature the frit will melt and flow across the pendant surface. Cut 2 pieces of 1 1/2 inch square. Place a piece of shelf paper on a shelf and place in kiln, stack two white layer on top of the paper. With a small spoon scatter colored mix on the top layer, do not cover the surface completely. Use a small brush to create some open areas. The open areas enable the mixture to melt and flow across the surface and create varying patterns. When fusing the layers leave the lid slightly open, set the switch to level 2, giving about 400 degrees. Bring it up to 1000 degrees and hold until the binders in the paper have burnt off and then close the lid. Move the switch up to level 5 and monitor the temperature as it climbs upwards, depending on your kiln you may need to go to full. Wearing your dark kiln glasses check the squares and mixture. Carefully check the temperature as you do not want the item to overheat. As the temperature rises the mixture will become molten and spread across the top layer rather than fusing down into the surface. The pendant will have spread and become round. When you see that the mix has spread, switch off, flash cool and let cool to room temperature. 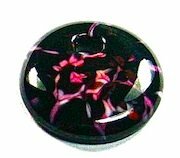 You should now have a nicely fused pendant to which you can attach a bail or drill a hole. There may some marks on the item where the mixture has commenced to fuse down into the surface. A clear cap will fix this and give your pendant a lovely finish. The two pendants below are smaller and have been topped with different colored blends.